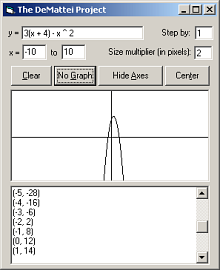 This is a pretty basic PC-based graphing calculator DeProgrammer made before he ever actually had to use a graphing calculator for math class. Handy program for taking notes on laptops. 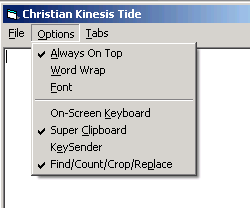 It was designed to stretch out across your screen in one dimension when you drag it to the edge--before Microsoft had the same idea. The elements (tabs and panels) can be rearranged and recolored as you please. 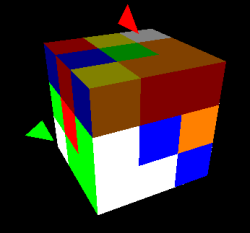 This is a lightweight and portable color-counting utility designed for pixel artists. It also helps you identify stray pixels--it sorts the palette by number of pixels per color. This is a lightweight, portable text editor, but in the menus, there is a sort of tab feature, an on-screen keyboard, a clipboard that can hold a lot of items, a keystroke emulator, an Always On Top option, and a somewhat complex (but not Regular Expression) find/count/crop/replace feature. BatMon is not a Jamaican man with a bat disguise. It is a graphical battery monitor for Windows-based laptops. There are 26 different images (blue, yellow, or red; anywhere from full to empty) that appear in the system tray depending on how full the battery is. Just one click and you can exit it. Version 1.0.1 reloads itself if Explorer crashes. 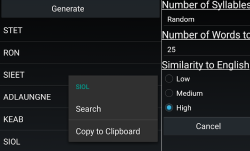 A program designed to list files the user drags and drops into it. For programmers, it is a good example of a few neat tricks, so request the source code. Card Puncher is a generic quiz/"flash card" app designed to facilitate effective learning through recall and recognition. It features in-app audio recording and playback, as well as on-the-fly quiz additions to streamline the initial creation of quizzes. The Answer Confidence feature allows users to skip questions that they can answer very easily, reducing the amount of time spent needlessly reinforcing that material. 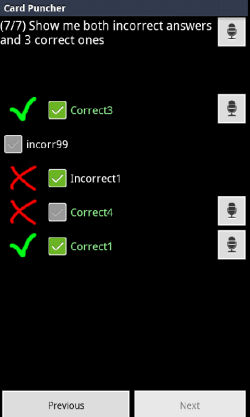 Quizzes can be made in any standard text editor. Text-only game that consists of counting, replacing every number that contains a 7 or is a multiple of 7 with the word "buzz." A tiny program that allows the user to type whatever (s)he wants and gives the user her/his average speed, ignoring any typoes. 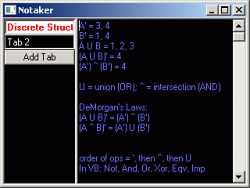 Text-only game that consists of you dividing large numbers repeatedly. 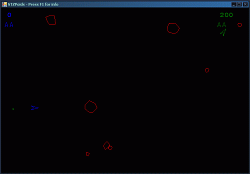 STZPoids is a simple two-player Asteroids clone made in four hours in C#. 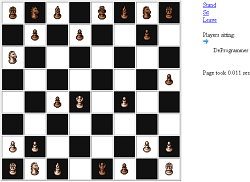 This program is practically a simple programming language and environment for making board games. The system is designed to support everything from checkers to more famous and complicated games with several stacks of random cards, dice, and so on. It comes with checkers and tic-tac-toe, but a few other games have been made for it. This also requires the Microsoft® WinSock Control.